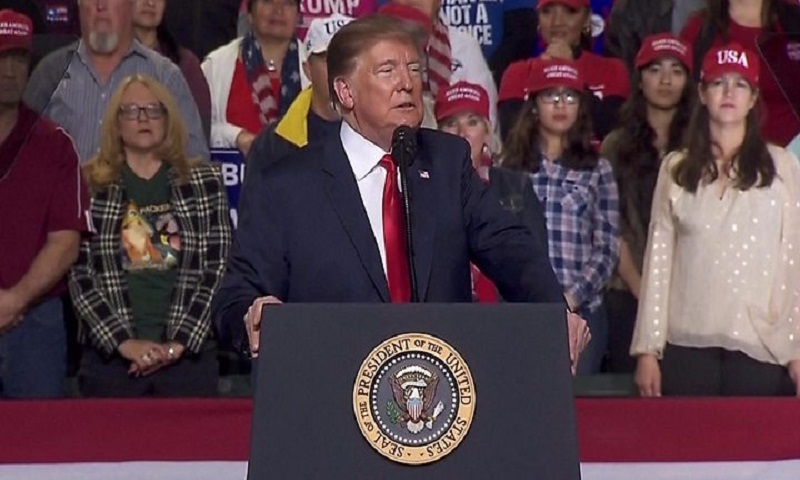 Donald Trump has condemned attacks on the media after an incident involving a BBC cameraman at the US president's rally in Texas on Monday. The BBC's Ron Skeans was shoved and sworn at by a man in a Make America Great Again cap in El Paso. The BBC later asked the White House to review security for media attending President Trump's rallies. The White House statement, from Press Secretary Sarah Sanders, added: "We ask that anyone attending an event do so in a peaceful and respectful manner." After Monday's incident, Mr Trump's campaign team thanked law enforcement for ejecting the unidentified man. "An individual involved in a physical altercation with a news cameraman was removed from last night's rally," said Michael Glassner, the chief operating officer for Trump for President Inc.
"We appreciate the swift action from venue security and law enforcement officers." The man, who a Trump campaign official said appeared to be drunk, gave Mr Skeans a "very hard shove", according to the cameraman.